The “module 4 -Submission procedures according to the guidelines of the EU Commission” is available in free download. The Module 4 offers a deep focus on the diverse issues relatid to the proposal submission, in order to ensure a successful outcome. The materials has been organized on a three level structure: the first group of slides considers the pre-submission period with useful general and technical guidelines; the second group concerns the application procedure, with particular reference to Erasmus+ and H2020 proposals; finally, the module offers useful tips for a successful submission and external links for further information. 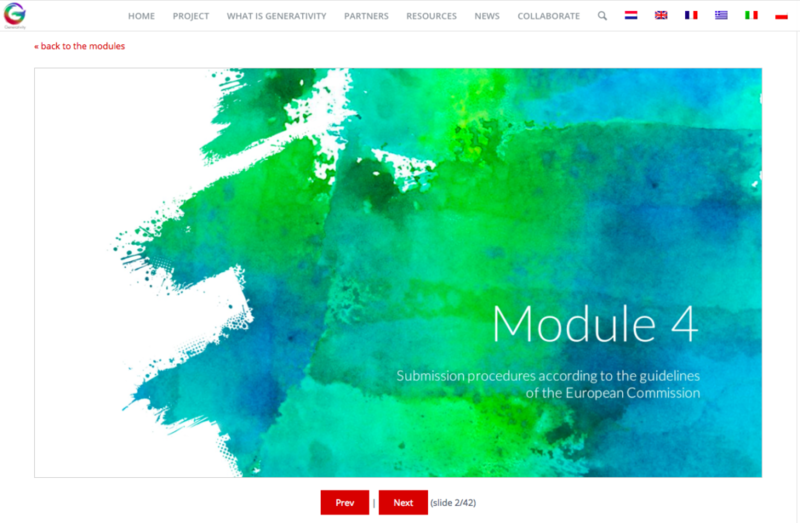 The”module 4 -Submission procedures according to the guidelines of the EU Commission” is available in English, French, Italian, Polish, Greek and Dutch. The module in download is accessible here. http://generativity.eu/wp-content/uploads/2018/03/module-4-screenshot.png 765 1170 teamGenerativity http://generativity.eu/wp-content/uploads/2016/12/small_logo-180x180.jpg teamGenerativity2018-03-08 11:33:052018-03-08 11:36:24The "module 4 -Submission procedures according to the guidelines of the EU Commission" is available in free download. The “module 5 – Project implementation and valorisation of results; finance and budgeting; and monitoring and evaluation” is available in free download. The “module 3 – Building an international, national and local partnership” is available in free download. Naamsvermelding-NietCommercieel-GelijkDelen (CC BY-NC-SA) tenzij anders vermeld.